This is it. We’re LIVE! This is the very first post of Emarky.net – the blog where I’ll be sharing actionable advice and stories to help others grow their online business using smart and effective strategies. Does that sound familiar? It might, because I’ve been blogging (here and at other places) before – but stopped doing that a few years ago. As of today, I’m back! Over the last 12 years I’ve been using all sorts of online marketing to grow my business , and over the last few years I’ve extended that by helping others to do the same thing as well – mainly by offering various online marketing tools. So how do you launch a blog when you’ve all the marketing experience you’d wish for? When you know all the viral-loops, best practices and smart tricks to gain extra exposure? 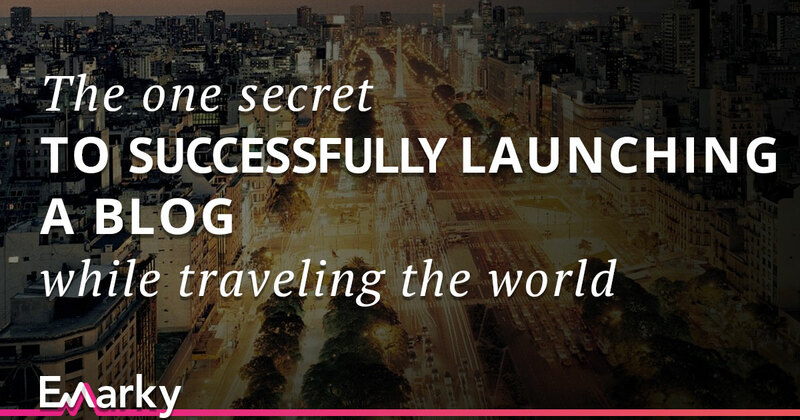 Do something extraordinary before the blog is live – and try to gain some momentum. Implement multiple viral loops that will keep getting traffic day in, day out. Connect with other influencers such as Derek Halpern, Brian Dean and others – and build a relationship with them hoping to get in front of their audience some day. Setting up multiple lead gens to convert the traffic into leads. Prepare multiple high-impact articles + infographics. By doing all of the above (and a ton of other things in advance) I’d make sure (or at least very likely) to make a big impact right away. I love to travel, so last weekend me and my girlfriend flew to Argentina (16 hour flight – yah!) to live and breath a new culture for a while. We immediately went looking for some office space and decided to work from the Urban Station co-working space. … I’m just going to launch the blog right away. So that’s it – within 24 hours after making that decision, I’m putting the blog live. No perfectly executed plan, but simply taking action and go from there. Why would I do such a thing, you ask? Because in-perfect action beats perfect in-action every day. Currently I’m running multiple business at the same time while I’m also planning on enjoying Argentina, which means I won’t be making “80 hour weeks” – at least not until I go back home. That means I have to spend my time with care, simply put. So there you have it. The one way to successfully launching a new blog (even in busy times) is to just go for it – and don’t wait around because you think it’s not ready yet. You can make it perfect along the way. Got ideas or just want to say hi? This post is (obviously) also to just say “Hi!” to everyone – and to kick off the new blog. I’d be super grateful if you could leave a reply below so I’ll know you’re reading.